It's not every day they get to do this. Fact: Being a celebrity is not a walk in the park. Their perfectly curated feeds and packed social calendars make it seem like they've mastered the art of #adulting, but they, too, need a break from time to time. Take it from Raymond Gutierrez, Sarah Lahbati, and Martine Cajucom—three television and social media personalities who make it a point to blend work and play. They always find a way to have a break—and make it an art form at the same time. See how they sign out from their busy lives and get inspiration for your next ‘me’ time. It's not every day she gets to do this, but Sarah's idea of 'me' time is a good read and an indulging snack on a lazy afternoon. Sounds like the perfect scenario! Mond is no stranger to having a packed calendar, but he makes up for it by going on short trips between breaks. At any given day, you'll see him exploring a nearby country like Singapore or showing up on the VIP list of the region's hottest events. As the creative force and co-owner of a local sunglasses brand, Martine manages to keep her cool-girl vibe by taking the time to play. Ice cream and IG-worthy backdrops, optional. Just like them, make sure to #neverstopplaying by giving yourself a break from the hustle and bustle of life. Your first order of business: sinking your teeth on a creamy ice cream bar! 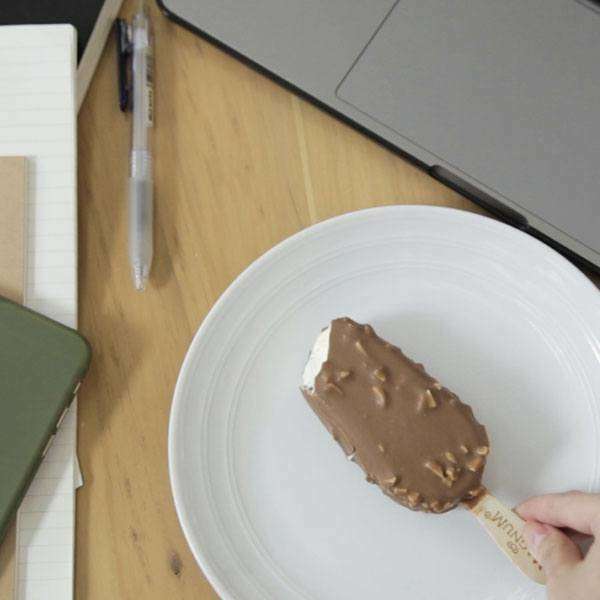 Magnum's combination of smooth vanilla ice cream, cracking Belgian chocolate, and crunchy almond pieces is exactly what you need to hit the refresh button. Follow Magnum on Facebook for more inspiration.